Canada is a country of many regions, and the cuisine of Canada very much reflects this fact. Each region of the country has its own unique dishes and flavors. As might expected, given the country's history, Canadian cuisine has been greatly influenced by both British cuisine and French cuisine. Canada has a long southern border with the United States, so it should be no surprise to find influences from United States cuisine too. Additionally, there are dishes inspired by German cuisine, as well as eastern European and Scandinavian influences, especially in the West of the country, and Canada's Chinese community have brought their own dishes too. Finally, Canada's earliest inhabitants, Inuit and First Nations people, also have their own dishes and culinary traditions. Poutine - One of Canada's most famous dishes. Poutine originated in the French Canadian kitchens of from Québec, but has become popular throughout the country. Poutine is simply French fries topped with cheese curds and covered with gravy. Lumberjack's breakfast - A traditional Canadian breakfast containing eggs, ham, bacon, sausage and pancakes. Pâté chinois - A French Canadian dish somewhat similar to Cottage pie: a layer of ground beef (usually mixed with chopped onions and peppers), covered with a layer of corn (a mix of whole kernel and creamed corn is usually used) and then covered with a layer of mashed potatoes. The dish may be sprinkled with paprika, and is often served accompanied with pickled beets. The name of the dish means "Chinese pie", and there are various as to the origin of this name, the most common being that Chinese cooks serving railroad workers were taught how to make the dish. Montreal bagels - Montreal bagels are the Canadian version of bagels. These bagels are prepared by boiling in honey-sweetened water and then cooked in a wood-fired oven. 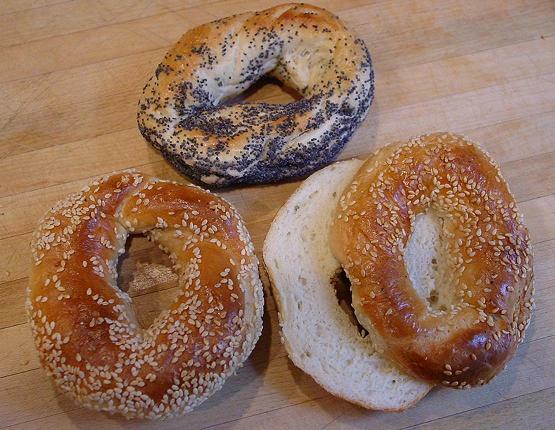 The bagels commonly come into two varieties: black-seed (sprinkled with poppy seeds) or white-seed (sprinkled with sesame seeds). TourtiLiègere - A traditional meat pie from Québec made using ground pork, beef, veal or even game, and sometimes also containing potatoes. These pies are particular popular during the Christmas season. Oreilles de crisse - Deep-fried pork jowls served with maple syrup. Fish and brewis - A traditional meal from Newfoundland, made using salted cod and hardtack (a savory cracker-like biscuit). Both the main ingredients are soaked over night (to remove salt from the cod, and soften both cod and hardtack) and then boiled separately before being put together. Scrunchions (pork rind) or butter with chopped onions and flower, is then drizzled over the mixture. Jigg's dinner - Another traditional meal of Newfoundland: salt beef, cabbage, and potatoes, as well as, optionally carrots and turnips. Traditionally jigg's dinner is served with pease pudding (a paste made from peas). Toutin - A Newfoundland pancake-like dish. dough fried in fat. Flipper pie - Seal flipper in a pie. Ginger beef - This Chinese-inspired dish has become popular in western Canada. Strips of beef are deep-fried and coated with a sweet sauce (ginger is one of the ingredients in the sauce). Nanaimo bar - A traditional Canadian dessert consisting of three layers, from bottom to top: a crumb layer (made using coconut, nut and wafer crumbs), a layer of vanilla custard, and a layer of chocolate. Butter tarts - A dessert made from butter, sugar and eggs in a pastry shell. Butterscotch, chocolate chips, coconut or dates may optionally be added. Figgy duff - A boiled dessert from Newfoundland. Figgy duff is a mixture o of butter, sugar, eggs and raisins, all boiled togetherin a bag. Two friends. Five months. One car. Ten provinces. Three territories. Seven islands. Eight ferries. Two flights. One 48-hour train ride. And only one call to CAA. The result: over 100 incredible Canadian recipes from coast to coast and the Great White North. In the midst of a camping trip in Squamish, British Columbia, Lindsay Anderson and Dana VanVeller decided that the summer of 2013 might be the right time for an adventure. And they knew what they wanted that adventure to be: a road trip across the entire country, with the purpose of writing about Canada's food, culture, and wealth of compelling characters and their stories. 37,000 kilometres later, and toting a "Best Culinary Travel Blog" award from Saveur magazine, Lindsay and Dana have brought together stories, photographs and recipes from across Canada in Feast: Recipes and Stories from a Canadian Road Trip. The authors write about their experiences of trying whale blubber in Nunavut, tying a GoPro to a fishing line in Newfoundland to get a shot of the Atlantic Ocean's "cod highway," and much more. More than 80 contributors--including farmers, grandmothers, First Nations elders, and acclaimed chefs--have shared over 90 of their most beloved regional recipes, with Lindsay and Dana contributing some of their own favourites too. You'll find recipes for all courses from Barley Pancakes, Yukon Cinnamon Buns, and Bannock to Spot Prawn Ceviche, Bison Sausage Rolls, Haida Gwaii Halibut and Maritime Lobster Rolls; and also recipes for preserves, pickles and sauces, and a whole chapter devoted to drinks. Feast is a stunning representation of the diversity and complexity of Canada through its many favourite foods. The combination of Lindsay and Dana's capitivating journey with easy-to-follow recipes makes the book just as pleasurable to read as it is to cook from. Learn the Canadian Style of Cooking, Eh. 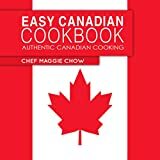 The Easy Canadian Cookbook is a collection of 50 Authentic Canadian Recipes. Real Canadian Cooking is a mix of French, Canadian, and North American style cuisines. And you will learn them all in this cookbook! No one can dislike good Canadian food. Dishes like Apple Scones, Shawarma, and Rustic Roasted Turkey are Candian classics you will learn in this cookbook. This cookbook will teach you an effortless style of Canadian cooking that will produce amazingly delicious and tasty meals. Enjoying Canadian food is as easy as going to the local grocer and grabbing some fresh meats and spices! Remember Authentic Canadian Cooking is a fusion of many great cuisines and you will learn them all in the Easy Canadian Cookbook! Pick up this cookbook today and get ready to make some interesting and great tasting Canadian meals! The Purity Cookbook has long been part of family traditions in many homes, and rare first editions are collector's items. Carefully reproduced from the original 1967 edition, this cookbook contains the recipes for an incredible variety of dishes, as well as tiny gems of kitchen wisdom that have been passed on from generation to generation. Handy charts detail the times for cooking vegetables, roasting turkeys, and cooking meat. With the Purity Cookbook, you can create an era of good, wholesome food just like your grandmother used to make. To celebrate 40 years of culinary creativity and recipe precision, the Canadian Living Test Kitchen have brought together 300+ of their must-have, must-cook recipes. From appetizers to desserts—and everything in between—this is the ultimate Canadian Living cookbook, celebrating the modern, fresh and healthy way Canadians like to eat. In this book, you will find 300+ recipes for dishes of all kinds, from appetizers to desserts; helpful resource section, with lists of substitutions, temperature and doneness charts, and cooking reference information; 100+ colour photographs; helpful cooking, shopping and preparing tips scattered throughout; complete index that groups all recipes into helpful categories, search by type of recipe (such as soup or frittata), ingredient (such as turkey or cherries) or recipe name and full nutrient analysis of each recipe. Canadian cuisine is recognized the world over as combining a unique array of fresh ingredients and a variety of cultural influences tempered by tradition. This third title in the Classic Canadian Cookbook series includes Canada's most beloved recipes - think Nanaimo bars, matrimonial cake, maple fudge, tourtiere, fish cakes, bannock, and wild blueberry jam. Known as the first truly Canadian cookbook, this faithful replica of the original edition is essential for cooks anywhere. The plucky spirit of 19th-century Canadian heroine Laura Secord permeates this collection, which was sponsored by the Laura Secord Candy Shops and created by the Canadian Home Economics Association to commemorate the Canadian centennial in 1967. Inspired by our national history and identity, it was destined to become an instant classic. From USA TODAY Bestselling Author Harper Lin: The 1st book (20,000-word novella) in The 4-book Emma Wild Holiday Mystery Series. Includes Holiday Drink Recipes! After breaking up with hunky movie star Nick Doyle, superstar singer Emma Wild returns to her hometown for Christmas to get away from it all. In Hartfield, a small town in Ontario, Canada, she gets caught up in a murder case after a fan's drink is poisoned at the Chocoholic Cafe, owned by Emma's sister Mirabelle. Who is the killer and was the drink originally intended for Emma? To add to the chaos, Sterling Matthews is the detective on the case. He'd shattered her heart nine years ago and inspired all her hit singles, but now they must work together to find the murderer before the murderer finds Emma. This is the first book in the Emma Wild 4-book Holiday Series.